AZ Adventure Series Maps - a gear review. 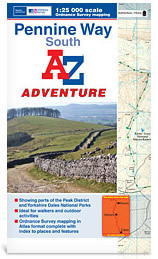 This new series of maps covering the National Trails have been produced in booklet format. Printed in close collaboration with National Trails and using 1:25000 Ordnance Survey mapping, these booklets offer a practical method of carrying maps when you are out walking. The booklets measure 13.5 by 24 centimetres, which is the same as traditional OS folded maps, offering an easy to use and convenient way of carrying accurate mapping when out in the great outdoors. We all know the problems using large sheet mapping in windy and rainy weather and this new format certainly makes life much easier in these conditions. Another age-old problem was folding maps correctly and rapid wear and tear along the fold lines. With the stapled booklet format these two problems should be eradicated. Priced at £7.95 each they offer a competitive alternative to large sheet mapping. My personal view is that this series will prove very popular with walkers as the mapping is in a much more user-friendly format. Is this the end of traditional maps? Probably not, despite AZ Adventure Series Maps offering a convenient method of carrying maps.